This is one of my favourite seasons of the year. I love having some time away from work and enjoying a little holiday cheer: good food, gatherings with friends and family, the chance to read a couple of new novels and going for long walks with the dog. It is also the time of year for the International Ice Hockey Federation’s World Junior Championships and a celebration of the great Canadian game of hockey. Like many Canadians, I love hockey. As a kid, I embraced the full sensory experience of the game. I loved the quiet stillness of an arena very early in the morning, the smell and feel of the cold air on my face, the crunching sound my skates made cutting across fresh ice and the distinct clatter of a puck being handled and snapped off a stick blade. Although uncommon on the west coast, playing shinny hockey outdoors on a frozen pond or field is one of the great simple pleasures in life. As I grew older, I loved playing games and being part of a team, competing with and battling against others. Sitting together with teammates in the dressing room, after a hard practice or game, and sharing stories and laughs, is truly the foundational cement that builds solid and lasting friendships. Even those Canadians who have no interest in the sport or begrudge the popularity of hockey, acknowledge that the game we invented is an iconic symbol of our great country. 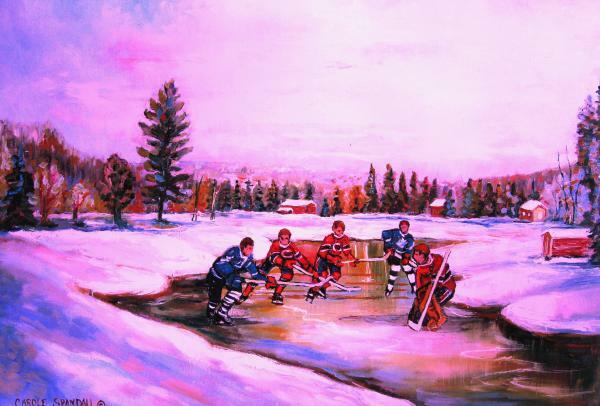 You can find hockey represented in Canadian art, statues, signposts, currency and postage stamps, from coast to coast to coast, all across our nation. Many have written about the impact of hockey on Canadians, including Peter Gzowski who called it "the game of our lives" or Billy Boyd who wondered if the "wintry religion" is a metaphor for Canadian life. Intellectually, I understand that Canada is a diverse nation, home to millions who neither understand nor care much about hockey. Emotionally, I want to believe hockey is ingrained deep within all Canadian souls. We all view the world through a lens coloured by our context and experiences, and Saturdays in our family was a time to gather around the t.v. to watch Hockey Night in Canada. I was an impressionable young hockey player in 1972 when Canada defeated the evil Soviet Union in an epic 8-game series in the midst of the Cold War. Hockey is a significant part of my Canadian history and culture. Canadians also excel in hockey. We are the best hockey nation in the world and are the reigning Olympic champions in both the mens’ and womens’ games. Inexplicably, this seems to disturb some in our country. There have been suggestions that the womens’ game should be dropped from the Olympics because Canada is too good and other nations are not closing the gap quickly enough. Some professional sports analysts and reporters lament that the World Junior tournament is boring and holds little interest for them, because Canada is too good and too often wins by lopsided scores. These notions are inaccurate, ridiculous and somehow, utterly Canadian - apologizing for being too good. More kids participate in soccer than any other game in Canada and yet our national side ranks 72nd in the world (men’s). As the most popular sport on the planet, we need to improve and we long for the day when our men’s team joins our women’s side, and returns to the World Cup. Four nations including Norway, Sweden, Finland and Russia have totally dominated cross-country skiing at the Olympics; therefore, should we pull these events from the games? In the recent World Cup of Rugby, the champion All-Blacks from New Zealand defeated Canada 79-15. Canadian rugby players should be proud they qualified to play against the best teams at the World Cup and this result should inspire them to continue to work hard and improve. The Americans have won 13 of 16 Olympic gold medals in men’s basketball and 6 of 9 golds in women’s basketball. The rest of the basketball playing nations must strive to reach this standard and the best stories are told when they do, as Argentina did capturing Olympic mens' gold in 2004. In Canada, we struggle for mediocrity in many international sporting events and we should never apologize for being the gold standard in the game we invented. Men’s, women’s and sledge hockey should continue to be among the featured sports of the Winter Olympic Games and all nations should aspire to reach the level Canada has set. The World Junior Ice Hockey tournament pits the best hockey playing countries in the world against one another once a year. It is a very difficult tournament to qualify for as the International Ice Hockey Federation actually hosts six different U20 World Junior Championships annually. In 2012, 46 countries will compete in IIHF U20 World Championship Tournaments: Worlds (Calgary/Edmonton); Division I/Group A (Slovenia); Division I/Group B (Poland); Division II/Group A (Iceland); Division II/Group B (Bulgaria); and Division III (Turkey). Canada has won the top tournament 15 times but has not captured gold the past two years. The Russians (or Soviets) have won gold 13 times while the Americans, Czechs and Finns have been champions twice and Sweden once. When hosted in Canada, as it is again this year, the games draw thousands of enthusiastic fans and each of the Canadian games are sold out in buildings that hold over 16,000 people (and millions watch on television). When held anywhere else in the world, the junior games mostly attract crowds in the hundreds. 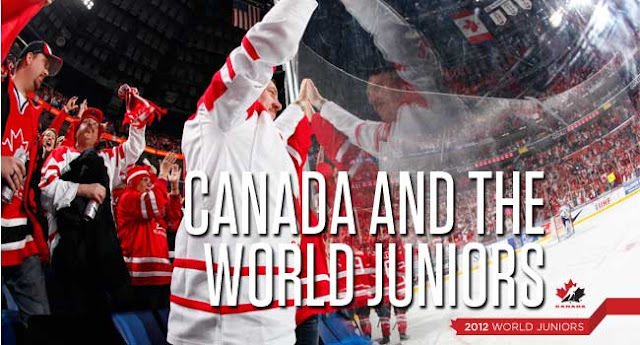 Canadians love watching hockey, and especially the World Juniors. We recognize the game in its purest form. Highly skilled, hard working and very committed young players who are proudly representing their country playing a game they love. Many are team captains and skilled players who are used to getting a lot of ice time on their respective junior or college teams, who willingly accept a much different and possibly reduced role just to play for their country. They skate every shift at full speed: they hit, they block shots and they play the game with the heart, will and spirit that sets them apart as Canadians. Away from home at Christmas, these teenagers face incredible pressure as the expectations are always for Team Canada to win gold. We also appreciate the tremendous speed, technique and skill of the talented American and European players. The games are fast, skilled and very physical but fighting and undisciplined play are unwelcome. Over the years, we have gotten a glimpse of future international stars as teenagers, just before their rise to professional prominence. Brilliantly skilled players like Igor Larionov, Sergei Fedorov, Pavel Bure, Alexander Ovechkin, Brian Leetch, Patrick Kane, Jaromir Jagr and Peter Forsberg. However, they are not all destined for the National Hockey League, indeed, like members of Team Canada each year, many do not go on to enjoy prosperous careers as professional hockey players. Yet we still love to watch because seeing these young athletes play with incredible heart and passion while representing their countries transcends individual success. The games are inspirational and, at times, magical. As in all sports, athlete training and coaching have advanced incredibly in recent years and while Hockey Canada still leads the way in innovation and research, all of the top hockey nations in the world can match Canada in terms of skill, preparation and knowledge of the game. They know that, if they play the perfect game, Canada can be defeated (fans will recall Switzerland blanking our NHL-laden Olympic team 2-0 in Turin in 2006). Unlike most other sports, hockey is a free flowing game. Hockey teams play within a structure, but the game is influenced by the individual and collective will of the players. You need skill and speed, but if you play with heart, passion and spirit, you can succeed. This is what separates Canada, still. I hope the Canadian juniors recapture gold; however, I look forward to the games that begin on Boxing Day, as I know that win or lose, the Canadians will make us proud. p.s. This year, I also have a warm spot for the defending champions from Russia. Last year, the underdog Russians came from behind in the quarter finals and semi-finals and met Canada in the final in front of a sold-out and mostly-Canadian crowd in Buffalo, New York. Down 3-0 going into the third period, the determined Russians scored five goals to win gold. They played like Canadians. This September, two members of that team and two others destined to play for Russia at this year's World Juniors, perished in the plane crash that killed every member of KHL professional team Lokomotiv near the central Russian city of Yaroslavl.